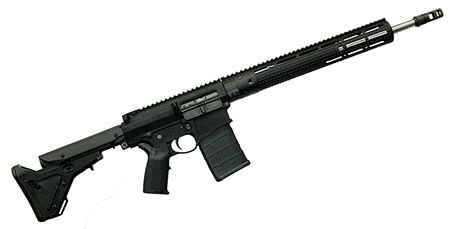 Core 100547 CORE30 TAC LR SA 308 Win|7.62 18 20+1 Magpul UBR Stk Black in. With the popularity of large caliber automatics growing every day Core Rifle Systems is proud of the flagship line the CORE30. Combining Core Rifle Systems relentless dedication to the cutting edge with the tried and true power of 308class cartridges the results are nothing short of astounding. Born of a solid block of 7075T6 aluminum the CORE30 line combines COREs trademark precision and unerring attention to detail with the finest parts and materials available. Machined in concert with the popular SR25 style platform parts interchangeability aftermarket parts and magazine availability are not a concern. This model features a Geissele SSAE 2 Stage Match trigger Magpul UBR stock SureFire SOCOM muzzle brake Type III HardCoat Anodized finish Magpul MIAD grip APEX Gator Grip 15 freefloat modular forearm and low profile gas block .750". If speed range and power are the need the CORE30 line can fill it."